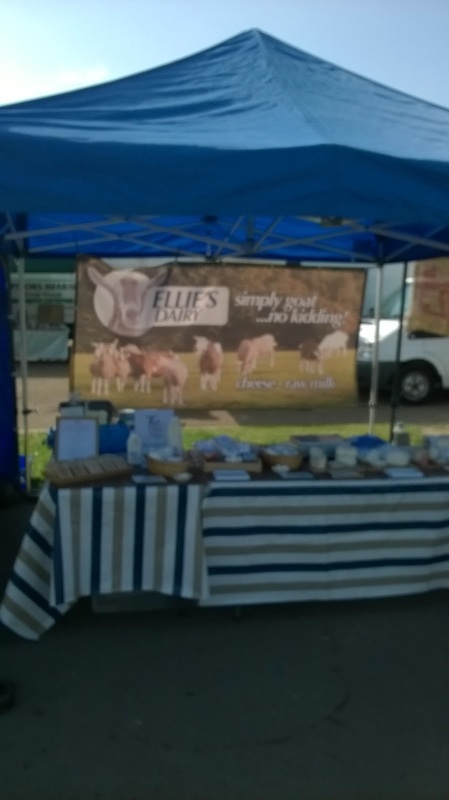 Ellie's Dairy - The Finest Goat Milk, from Kent: All change! Joe is an old hand at Borough Market now ... figured out all the short cuts to drive up there quickly and get parked and set up in good time to start trading. Our first week was very respectable, considering that it was our first week. And it was August (notoriously poor for markets when everyone goes on hols!). The only really bad day was Thursday courtesy of the Tube strike .. apparently there was a lot of free bread being distributed by the bakery stalls at the end of trading that day! It would seem that quite a lot of our regular London Farmers Market customers are also starting to find us at Borough and it is lovely to see some familiar faces among the crowds. 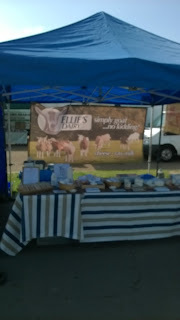 Not to be outdone by Joe, Anthony and I also have new banners for our market awnings. I gave mine its first airing at Balham on Saturday. Very handy to keep the sun off the cheese! 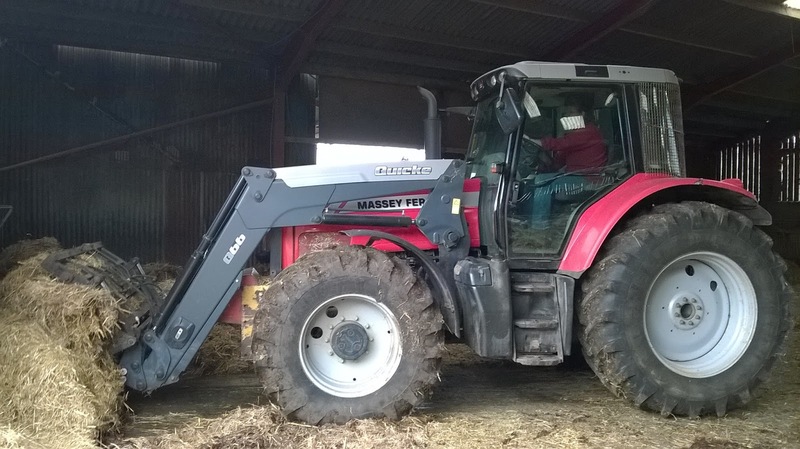 As it is almost mating time again (where does the time go?! 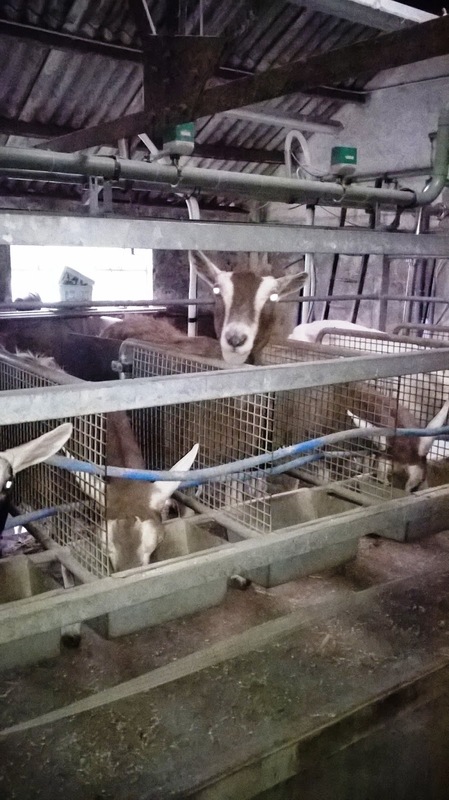 ), we have moved the young goatlings into the main barn so that they get used to all those big stroppy old milkers before they get pregnant and have all the stress of kidding and milking themselves. There are only 15 youngsters this year and they have already fitted in very well, although they are still a bit wary of some of the older goats. 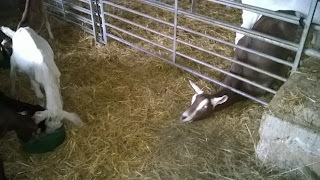 Old Betty is always a bit grumpy with new girls coming into HER herd .. but I did spot her sharing a food bowl with one of the goatlings yesterday! Must be getting soft in her old age. 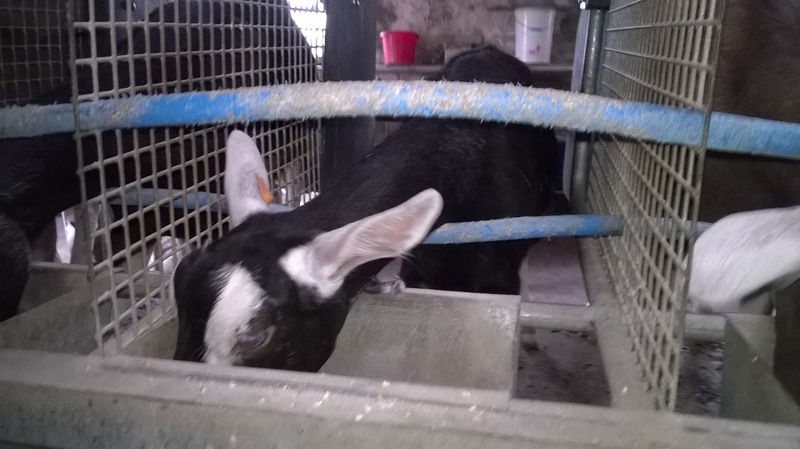 We do not force the goatlings to come through the milking parlour but gradually curiosity gets the better of them and they come in to find what is going on through that little gate. Once they find out that there is food available, in a personal trough, then there is no stopping them! Here is young Ruby who came through last night - what a brave girlie she was! And it was good to see our oldest girl Tammy still fit and healthy and producing milk. Not much of it, but she still makes a decent contribution to her feed bill! 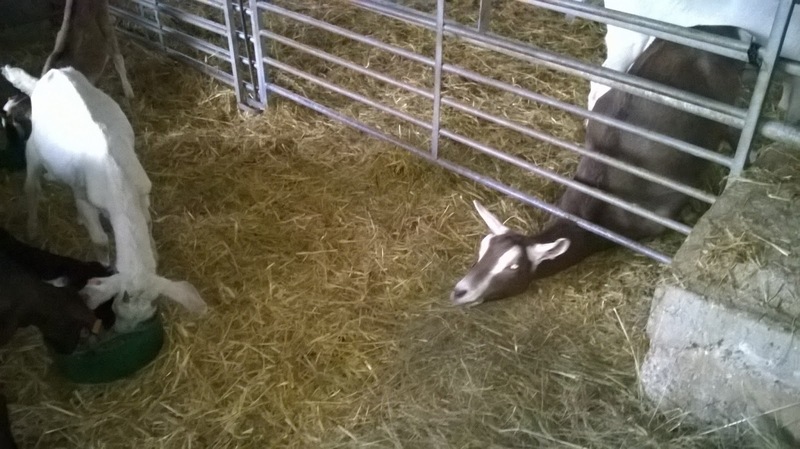 The mums and babies are all back in with the main herd so the babies have all their aunties around them now. There can be quite a lot of noise at milking time as the mums come through the parlour and the babies stay behind, but it all seems to work out OK. 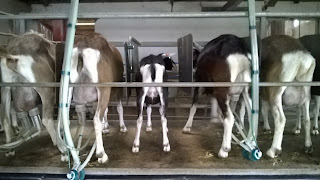 The kids have certainly all grown up very quickly and are already a good size. The little female kids are now just the other side of the fence from all the milkers. Esther decided that they were obviously getting something far more interesting to eat than she was ..
And how about this for a cheeky face ... Bassey goat giving me a hard stare when she had finished all her food. 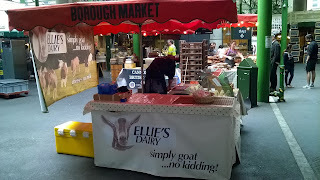 Hi Debbie, I was so pleased when I heard that Ellie's Dairy had secured a stand at Borough Market. Very well deserved! 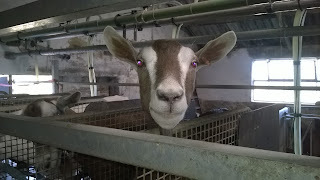 I look forward to many more years of enjoying delicious unpasteurised goat's milk.